The aim of the game is to get rid of all of the cards that you have been dealt. To achieve that, the players must arrange certain combinations of cards that they can play on the common table. The first to play all of his cards is the winner of the round. He receives score points. Another aim is to keep the number of cards that you weren't able to play as low as possible, because every player except for the winner receives the total of his card points as minus points. Normally you would play a couple of rounds and the winner is the one with the best score. Each player receives a card holder. The cards are shuffled on the middle of the table and piled to a couple of piles face down. Every player draws randomly 14 cards from any of those piles, which he places into his card holder in a way that they can't be seen by the other players. The 3 layers of the holders allow the player to sort the cards to get a better overview of them, for example by colors. The players decide who will begin and then play clockwise in turn order. The player whose turn it is must either place cards in the middle of the table, or if he can't or won't lay any card, must draw a face down card from any of the piles. Permitted combinations that a player can lay in the middle must always consist of at least 3 cards, which belong to together as either a row or a set. Adding cards to existing rows or sets on the table is a move which is allowed after the initial opening. A group or set consists of 3 or 4 cards with the same number (but all have different colors, e.g. a yellow, blue, black and red 7). A run or row consists of 3 or more cards in the same color with consecutive numbers on them (e.g. a black 6, 7, 8 and 9). The total value of the cards in the initial opening must reach at least 40 points. These points can be dispersed in many different combinations. As long as the player doesn't have this amount of points in his combinations, he must keep drawing cards. When he finally receives the card that allows him to reach this total value, he must wait for his upcoming turn to play them out. The value of a card is equal to the number shown on it. A Joker can be used as a placeholder for any given card, color or number is irrelevant. However, the value of a Joker is always 25 points, irrespective of the card he is replacing. 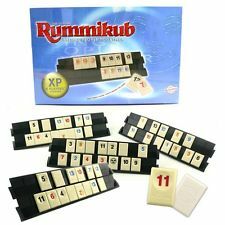 Only once a player has played his initial sets of 40 points, he is allowed to add cards to previously existing combinations on the table. He may add them immediately after he has come out with his initial 40 and he doesn't have to wait for his next turn. In general, the combinations on the table don't belong to anybody in particular. This means that every player is allowed to utilize any combination on the table, once he has played his initial 40 points. In his turn, the player is allowed to add as many cards to existing combinations as he wishes and is able to. You may use cards from existing combinations for your re-arrangement. Either you use all cards of a set or you only use parts of it. In the latter case, there must be at least 3 valid cards remaining in the original combination. All cards and combinations involved in a re-arrangement must remain on the table at all times, and once the player is done with re-arranging, all combinations on the table must be complete and valid. Another examples: The set of blue 8, black 8, yellow 8 and red 8 is on the table. You have a red 7 and red 9. You may take the red 8 to build a new row of red 7, 8 and 9. On the table are the rows of black 4,5,6,7, yellow 4,5,6,7 and blue 4, 5, 6. You have a red 4, 6 and 7. You re-arrange all rows into sets, namely a set of 4 (black, yellow, blue and red), a set of 5 (black, yellow and blue) a set of 6 (black, yellow, blue and red) and a set of 7 (black, yellow and red). There are two jokers in the game. They can be used for any tile in a set. A joker used in the opening set scores the value of the tiles it represents. A joker can be retrieved from a set on the table by a player who can replace it during his turn with a tile of the same numerical value and color it represents. The tile used to replace the Joker must come from a player's rack and not from the table. In the case of a group of 3, the joker can be replaced by the tile of either of the missing colors. A joker that has been replaced must be used in the player's same turn with 2 or more tiles from his rack to make a new set. Players cannot retrieve a joker before they have laid their initial set(s). A set containing a joker can have tiles added to it and can be split apart or have tiles removed from it. The joker has a penalty value of 30 points if it remains on a player's rack at the end of a game. Players must complete their moves within 2 minutes. If a player hasn't finished within this time, he must take all cards on his card holder that he wasn't able to sort into a valid combination. 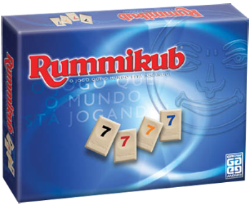 After a player has cleared the rack and called "Rummikub", the losing players add up the value of the tiles they are holding on their racks. This score is totaled as a minus (negative) amount. The winner of the round receives a positive (plus) score equal to the total of all the losers' points. At the end of each round, each player totals his minus and plus scores to produce a total score. As an aid to checking the figures, the plus score should equal the total of the minus scores in each round and in the final tally. 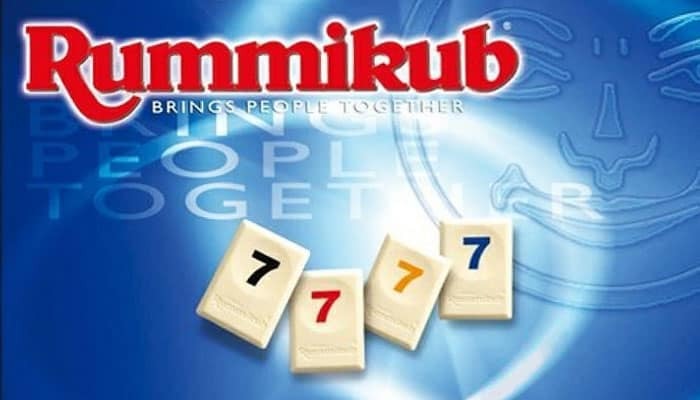 In the rare case that all the tiles in the pouch are used before any players goes "Rummikub", the player with the lowest count on his rack wins that round. Each loser adds up his total tile value and subtracts from it with the winner's total. This result is scored as a minus amount. The total of these is scored to the winner as a plus amount. After scoring the round, place all the tiles back in the pouch, and begin the next round by following directions under set-up. As soon any player laid his last card on the table, he ends this round and wins. The remaining players calculate all the cards that they still have at this time on their card holder (Joker 25 points!). Each player writes down his points as negative points and the winner scores the sum of all points of his opponents as positive points. The game continues the number of previously agreed rounds. At the end of the match everybody adds his positive points and deducts his negative. The winner is the one with the highest score.